Oh, Tyra. What were you thinking? This cycle of America's Next Top Model got us all hot and bothered with the introduction of eight male contestants to the competition. We had a crush on Phil Sullivan and his boho-chic scruff from the start, but sadly he only made it to the Top 8 and missed a spot in the finale, which airs tonight on the CW. 1. You may remember him as the "guy with the weave," a.k.a. Tyra's worst makeover idea ever. 2. It was one of the biggest WTF moments in the history of the show. 3. 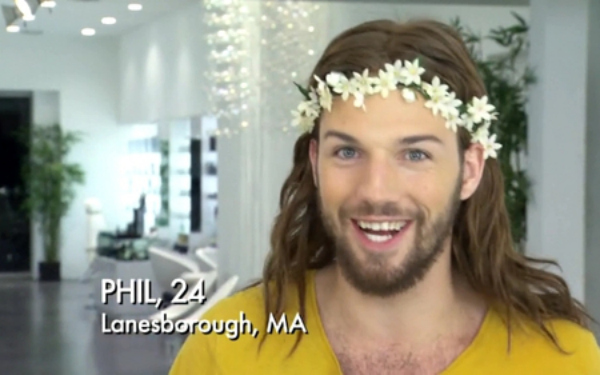 Nonetheless, Phil seemed like a winner from a start after that kiss with trans ANTM-hopeful Verge. 4. After the show, he was signed by AIM Model Management, and he's now beginning to make waves as a professional male model. 5. Last September, we were happy to find him modelling for Lucio Castro at New York Fashion Week. 6. Smart move though to follow Tyra's advice and let his natural hair grow back. 8. And he's not afraid to show it. 10. To sum up, whoever wins the competition tonight, we predict big things for this 6'3" hunk from Lanesboro, MA. America's Next Top Model finale airs on the CW Friday, Nov. 15 at 9 p.m. EST.